Ptosis is a condition in which the eyelid droops. 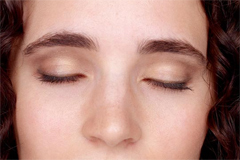 It is caused by a weakness or separation of muscles deep within the eyelid. Ptosis does not involve excess skin or tissue in the eyelid (a condition called dermatochalasis). It is usually a result of aging, but some people develop ptosis after eye surgery or an injury, and some children are born with the condition. A brief surgical procedure can eliminate the drooping. Many young patients with mild to moderate ptosis do not need surgery early in life. Patients who are also suffering from excess skin may choose to undergo blepharoplasty at the same time as ptosis repair. Children with ptosis should be examined regularly to check for other vision problems including amblyopia (“lazy eye”), refractive errors and muscular diseases. Stitches are removed after a week and most people return to work relatively soon after the procedure. Contact lenses may not be worn for two weeks. The effects of blepharoplasty can last for a long time and are sometimes even permanent. Ectropion is a “turning out” of the eyelid that causes redness, irritation, tearing and an increased likelihood of infection. Common causes of ectropion include aging, sun damage, tumors, burns and the removal of too much skin during blepharoplasty. Artificial tears can help provide temporary relief from dryness. Ectropion can be corrected in a quick procedure in which the lid is tightened. Occasionally, the surgeon needs to graft a small segment of skin to ensure that the eyelid is fully repaired. » For more information on Eyelid Treatments or to make an appointment, call us at either our Philadelphia office 215-627-1515 or our Ardmore office 610-649-7616.